We particularly liked the line, “When people aren’t having any fun, they seldom produce good work.” Peter Mayle, our interpreter of “the good book according to Ogilvy,” said that this meant “the mavericks”– the creative people – should indulge in long lunches in Soho. Indeed, one rarely repeated heretical Ogilvy nugget stated that, “People are more productive when they drink. I find if I drink two or three brandies, I am better able to write.” This of course became the mantra for an entire generation of advertising folk as we became better paid, along with the Sixties explosion, and traded in our Cortinas for snazzier models. After all, “Pay people peanuts and you get monkeys,” said Ogilvy. We loved that one. 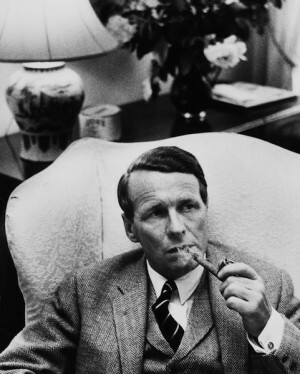 I suspect that Ogilvy’s Turnbull & Asser shirts and puffing pipe were as much an egregious concoction as the man in the Hathaway eye patch he had made famous, but who could fail to be seduced by a little British narcissism fused with hard-nosed American, self-serving salesmanship. Famously stating that “ninety-nine percent of advertising doesn’t sell much of anything to anyone,” it’s easy to see how this book became such required reading when it was first published. Quoting everyone from Mencken to Churchill; from Savignac to Mikoyan; from P.T. Barnum to Aldous Huxley, Ogilvy, the (briefly) Oxford-educated Madison Avenue honcho, made advertising not only cool but also, for the first time, almost respectable. In the world of advertising, this little book has ensured him that company.